Highland distillery Arbikie is preparing to release its first rye spirit next year in a one-off bottling to raise money for research into Motor Neurone Disease (MND). The Angus distillery has been growing rye on its farms since 2014, carrying out the first rye distillation in pot stills the same year as part of a series of experiments using different varieties and production techniques. 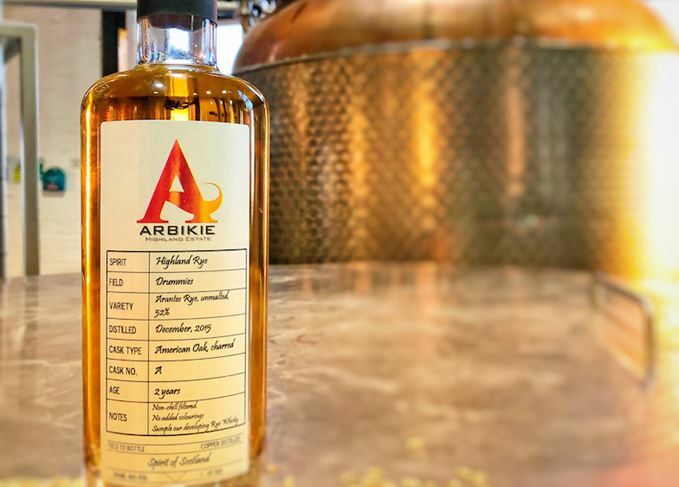 Now Arbikie has bottled a batch of two-year-old ‘Highland rye’ spirit, distilled in December 2015 – it cannot be called whisky as it has not been aged for three years – matured in charred American oak casks. It is believed to be the first rye spirit made and released in Scotland for about 200 years. The spirit is made from 52% unmalted Arantes rye, plus 48% Odyssey malted barley, with 355 bottles set to be released in 2018, priced at £100 each and bottled at 48% abv. All proceeds will go to the Euan MacDonald Trust, which was set up to help find a cure for Motor Neurone Disease (MND). Arbikie’s ‘Scottish’ rye whisky will become a permanent part of the range later in 2018, and the distillery is planning to release an ‘American’ style of rye, also later next year, with a higher rye content and using ‘traditional American distilling approaches’. This cannot legally be called Scotch whisky, however. Brothers John, Iain and David Stirling, who founded Arbikie, decided to raise money for MND research after their father was diagnosed with the condition about 18 months ago. Arbikie also recently organised a charity event called ‘Field of Dreams’ with Scottish rugby legend Doddie Weir, who revealed that he had been diagnosed with MND in June this year. The distillery plans to continue to work with the trust in the future. Rye distillation is currently staging a revival in Scotland, with a growing number of distillers, including InchDairnie, Bruichladdich, Diageo and Lone Wolf carrying out commercial rye distillations in recent months. The Angus farm distillery has released Scotland’s first rye whisky in over a century. Bruichladdich and InchDairnie have run commercial distillations of pot still rye spirits. The Whisky Virgin finally gets to visit a distillery – not in Scotland, but in East London. Has there ever been a more exciting time for whisky? Probably not, says Richard Woodard. An undefined term and a path toward too much choice will complicate an already complex industry.